Juno Beach is a beachfront town just south of Jupiter and east of Palm Beach Gardens. Here beach lovers and fisherman congregate and make beach life a part of their daily routine. Any time of the day you can find people beach combing, walking along the beach for exercise, fishing from shore or fishing from the Juno Beach Pier. One of the reasons people come to Juno is because the condos here are directly on the ocean unlike Jupiter to the north. One of these smaller complexes is The Colony. 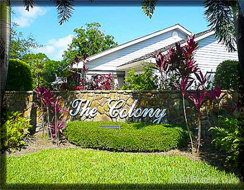 The Colony Condos online now. All listings & Sold Statistics! Condos in The Colony were built in the 1960’s and are modest in size with just two bedrooms and two baths. Inside living space is about 1,200 square feet. The split floor plans means there are ocean views from nearly every room and once you open the sliding doors you will fill the home with our fabulous ocean breeze. The Colony is located where Celestial Way swings east from the Beach Road and out your front door is a small lake called Pelican Lake where there is a small gazebo over the water to enjoy the birds that congregate here daily. Across from Pelican Lake is a small playground open to residents. Units also have views of the pool and garden area in the complex. Sandy feet are the order of the day here in Juno! You will want to make the beach a part of your daily lifestyle whether that is a sunrise walk along the shore or fishing at dusk for snook, cobia or pompano. And although Juno Beach is a small town, the famous shopping and dining hub of Palm Beach Gardens is only about a 5 minute drive away. Here at the Gardens Mall you will find Saks and Nordstrom’s and along the Intracoastal Waterway there is great waterfront dining at place like The River House. 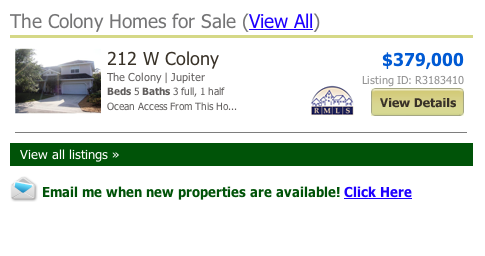 Posted in Jupiter Condos, Uncategorized on July 2, 2011 at 7:33 pm.